Epic 'City On Fire' Burns Almost Too Brightly Garth Risk Hallberg's massive debut novel is a headlong rush through New York in the 1970s; critic Jason Sheehan says Hallberg writes "like he's not sure anyone will ever give him a second chance." In every book, you have to find a character that you love. This is true for authors as well as readers — we both need something to hang onto when the going gets rough, someone to root for, someone in whom we find small fragments of ourselves. This is doubly true in this epoch of the multiply-narrated novel and the omniscient voice. Triply true when authors get to door-stopping and their books creep upwards of five-, six- and seven-hundred pages. When you're talking about that kind of commitment, you want to do your time with someone you like. Me? I like Charlie Weisbarger — one of the (many) POV characters in Garth Risk Hallberg's epic, monstrous, beautiful debut novel, City On Fire. Charlie is 17, dorky, asthmatic, a newly minted punk from the Long Island suburbs, in love with Sam, the unattainable girl 10,000 times cooler than he is. Here he is, sneaking into the city with her on New Year's Eve of 1976 to see a show — last gasp of the legendary (and fictional) punk band Ex Post Facto, at the kind of place where the guy working the door is named Bullet. At Penn Station, Sam's recklessness returned. She hustled through the hot-dog-smelling crowds ... [And] Charlie, by now well-lubricated, had the impression of a great light beaming from somewhere behind him, setting fire to every dyed-black hair on the back of her head, her several earrings, the funny flattened elfin bits at the top of her ears — as if a film crew was following, lighting her up. Of lights not reflecting off things but coming from inside them. Inside her. Who hasn't been there? Hasn't made that walk in Charlie's shoes — chasing love and lust and fear down bad paths that make the world shine despite what lies at their ends? Things are going to go bad for Charlie. They're going to go worse for Sam. But in that moment, Charlie is all of us — young and dumb and sweet and scared and perfect. And this is the best thing about City On Fire — there's hardly a minute in it that's not recognizable. That doesn't buck and thrum with feedback or ache like heartbreak or taste of champagne. No matter where you come from, who you love or what you do, you can slip into the skin of (almost) any one of his characters and feel the world like a real, round and living thing closing its fist around you. The worst thing? It takes Hallberg more than 900 pages to do this. City On Fire is a book about New York in the middle-'70s. There are people in it, sure, but they spend long runs of pages as nothing more than eyes and ears and noses; there so that Hallberg can relate the look of knuckled trees against a winter sky, the guttering of a trashcan fire or the smell of fresh blood. It concerns, among other things, a punk band, a New Year's Eve party, art and disco and the Great New York Blackout, but most centrally the shooting of a girl — Charlie's crush, Sam — in the first minutes of New Year's Day, 1977. Hallberg writes like he's not sure anyone will ever give him a second chance. Hallberg writes like he's not sure anyone will ever give him a second chance. There are places where you can taste his panic and his need to use every word he knows now. And there should've been an editor around to tell him that keeping something in your back pocket for later ain't always the worst idea in the world — but there's also something to be said for a guy that just leaves it all on the table. City On Fire is the book that everyone is going to talk about this season because it's big and loud and, most importantly, new. Because someone at Knopf paid a lot of money for it. Because it really is amazing (even if it might've been more so at, say, 600 pages rather than nearly a thousand). But I'll love it because of Charlie (whom I walked beside for all those pages) and because Hallberg took the worst days of New York and turned them into a jittering fantasy, almost magically alive and teetering on the edge of a hundred revolutions, where everyone knows each other and every tragedy, small or large, is just as important as any other. 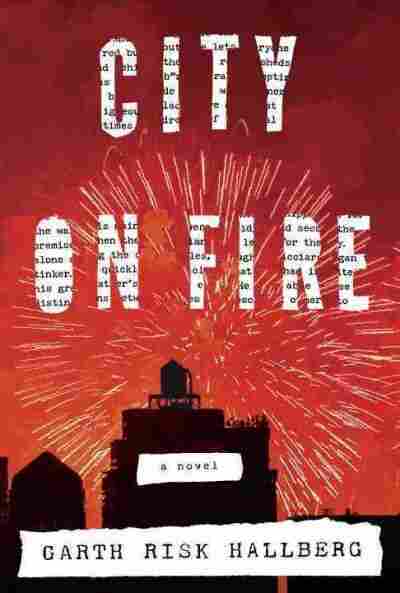 While City On Fire might not be the proverbial great New York novel, it's not far off. And I can't wait to see what Hallberg does next.